Elegant leather look PU tape measure with a durable 1 metre non stretch locking tape which is calibrated in centimetres. It is ideal for use around the home or office. Colours: Black. Dimension: Dia 53mm x 18mm. Print Description: 40mm circle. Print Type: Pad Print. Packing: Loose packed. Round locking tape measure with a durable 1.5 metre non stretch tape which is calibrated in both inches and centimetres. It is ideal for use around the home or office. Colours: White. Dimension: Dia 52mm x 14mm. Print Description: 40mm circle. Print Type: Pad Print. Packing: Loose packed. 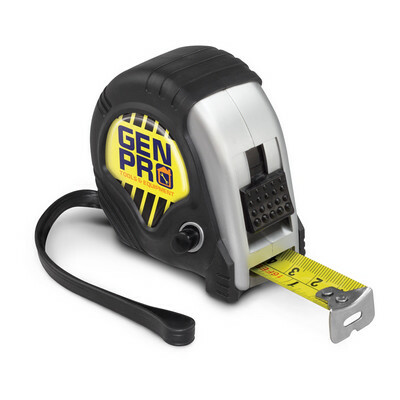 Metric tape measure with a two metre metal locking tape, a belt clip and a wrist strap. Colours: Black. Dimension: W 22mm x H 60mm x 58mm. Print Description: 40mm x 40mm. Print Type: Pad Print. Packing: Individual boxes.